Nebraska is corn crazy. Corn has dominated lives of Nebraska residents for years. Everywhere you go, there is evidence of corn-mania and corn frenzy as if corn was their signature theme. As you drive into the city after arriving at airport in Omaha, Nebraska’s largest city, you see acres and acres of cornfields for miles. Nebraska Cornhuskers is the name given to the University of Nebraska–Lincoln football team. The Husker football team plays its home games at Memorial Stadium, selling out every game since 1962. The city’s magnificent stadium swells to over 90,000 cheering fans on game days, making it the third largest city in Nebraska. Enjoy the Cornhusker game with a bag of corn popcorns. Visitors stay at the five-star chain, named the Cornhusker Marriott Hotel. If you go out to eat, corn is sure to be an item on the buffet table. Corn grown by Nebraska farmers finds its way into an incredible variety of uses, from the traditional use in livestock and poultry feed to newer arenas like ethanol and bioplastics. Nebraska’s capital city, Lincoln, named after Abraham Lincoln, is fast becoming an attractive place to raise a family. Wilbert, a Hawaiian-born resident, moved his family of four, leaving his sea-side village in 1990, to Lincoln in search of a better life and has not regretted it a bit. He was able to find a job easily and could afford to buy a house within a year. Two of his brothers followed him and they are now encouraging their friends to come to Lincoln, population 258,379 according to 2010 census. Downtown Lincoln has always been the economic and social center of the city with the Haymarket area being the heart of this downtown core. Haymarket remains a popular hot spot for restaurants, farmers markets and businesses, but the outskirt area of the West Haymarket area, once a bustling railroad station, has become a run down. Plans are afoot to quickly create it as Lincoln’s new entertainment district. The underutilized properties will be transformed into restaurants, shopping centers, public outdoor spaces, condominiums, hotels, as well as the Pinnacle Bank Haymarket Arena, featuring the University of Nebraska-Lincoln (UNL) men’s and women’s basketball teams as anchor tenants. The most inspirational and tranquil place to stay in Nebraska is the River Inn Resort, located between Omaha and Kansas City on the Missouri River. 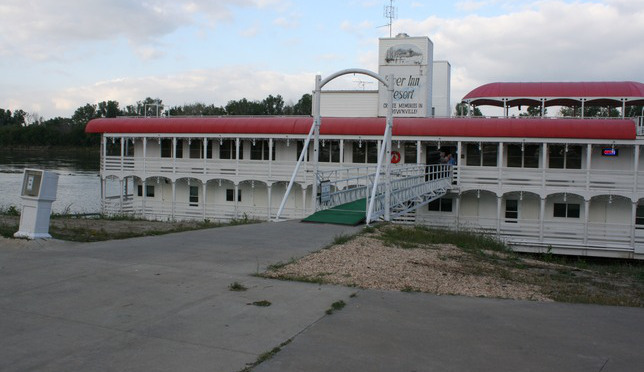 The resort offers bed and breakfast on a former casino boat permanently docked in Brownville, population 128. The husband and wife team who own the resort are very hospitable and would cook and serve an absolutely wonderful breakfast consisting of fresh fruit on a skewer, quiche, blueberry muffin, hash browns and a slushy orange-pineapple juice! The rooms are clean and modern with TV, telephone and comfortable mattress, ensuring a unique experience to visitors. An ideal setting for honeymooners and regular vacationers seeking peace and tranquility. Very close to the River Inn Resort is Brownville, a perfect picture postcard village in Nebraska with a population of 132, which has become important as a tourist attraction with several old houses converted into museums. There are also art galleries and wineries in and near Brownville. Nestled in a valley alongside the Missouri River, this quaint little village’s importance increased when in 1970 First Lady Laura Bush, designated it as one of the nation’s newest Preserve America Communities. Another distinction bestowed on Brownville is that in 2004, it became part of the Booktown movement when it was named one of only three booktowns in the US – the other two are Grass Valley, California and Stillwater, Minnesota. Jane Smith, who owns the Lyceum Bookstore Restaurant, was the one responsible for getting Brownville recognized. With dedicated and experienced staff on his team, Chapo said it has become a place where children could get up-close to animals and surround themselves in scenic gardens. “ Children are allowed to touch animals of all types – fur, fins, feathers, scales and more. They can feed animals directly and can ride an animal. Here children can become an animal and can connect one on one with any of the 100 species that reside here,” said Chapo. For high school students, the zoo holds a “zoo school” where the zoo’s extensive animal and plant collection are observed, measured and studied as a living laboratory. Lincoln Children’s Zoo is a home to over 350 animals, more than 40 of which are endangered. Nearly 200,000 people visited the Zoo in 2012, making it the third most attended arts and science attraction in Nebraska. This “high school” for animals holds summer classes aimed at teaching children about animals and their habitat at an early age. Nebraska is fortunate in having institutions like the Lied Lodge and Conference Centre and the Lincoln Children’s’ Zoo, which not only practices but also preaches valuable lessons on nature, animals, tress and how to preserve our environment. * Mansoor Ladha is a Calgary-based journalist, author and travel writer. He was publisher of the Morinville Mirror and the Redwater Tribune newspapers.